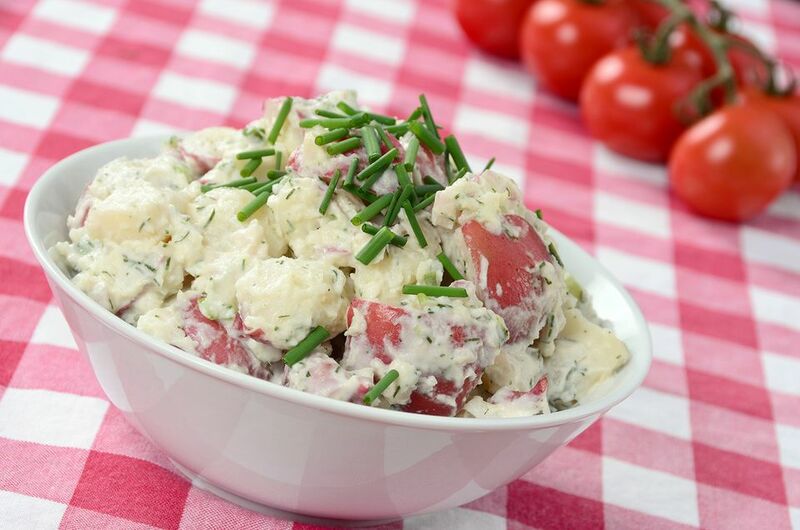 This tasty potato salad will be the star of any potluck supper or a wonderful addition to a picnic lunch or dinner. It is made with red-skinned potatoes and a delicious mayonnaise and sour cream dressing that gets extra tang from a splash of white vinegar. For a more flavorful twist, opt for a homemade herbal vinegar. Celery and equal amounts of red onion and green onion (aka scallion) add crunch to this classic salad, and hard-boiled eggs provide some protein and a flavor boost. Low-starch red potatoes are firm enough to hold up nicely in this salad after they're boiled, but round white potatoes, Yukon Golds, new potatoes of any color, or other low-starch, "waxy" potatoes may be used as well. The salad will keep for three or four days in a sealed container in the refrigerator. Peel the potatoes or, to retain the red color and texture of the skins, leave them unpeeled. Cut off any bruised or damaged parts or eyes. Cut the potatoes into bite-size chunks and put them in a medium saucepan. Cover the potatoes with water and bring to a boil. Reduce heat to medium-low and boil for about 10 minutes, or until potatoes are just tender. Drain and let stand with the cover ajar to cool. Meanwhile, put the eggs in a saucepan and cover with water. Bring the eggs to a full boil over medium-high heat. Cover the pan, remove the eggs from the heat, and let them stand for about 15 to 17 minutes (or for less time if you like moister yolks). Do not remove the cover until the time is up. Drain the cooked eggs and run cool water over them. When they are cool enough to handle, peel and coarsely chop them. Put the cooled potatoes in a large bowl with the chopped eggs, celery, and red and green onion. Cover and refrigerate until thoroughly chilled. Combine the 2/3 cup mayonnaise, white vinegar, sour cream, salt, and pepper. Gently stir the mayonnaise mixture into the potato mixture until well blended. Add more mayonnaise, if desired, to increase the amount of moisture. Add more salt and pepper, if desired, to your taste. Store in a covered container and keep refrigerated.